My clients are everything to me. Without you, I could never continue to create beautiful memories and artwork! For this reason, I would like to reward you for choosing me year after year to capture your precious milestones! I have designed a 3 tier loyalty program that I hope you will be happy with! Check each tier out, and let me know what you think!! *Loyalty Client Status will be updated at the beginning of every calendar year based on the booking trends of the previous 2 years. 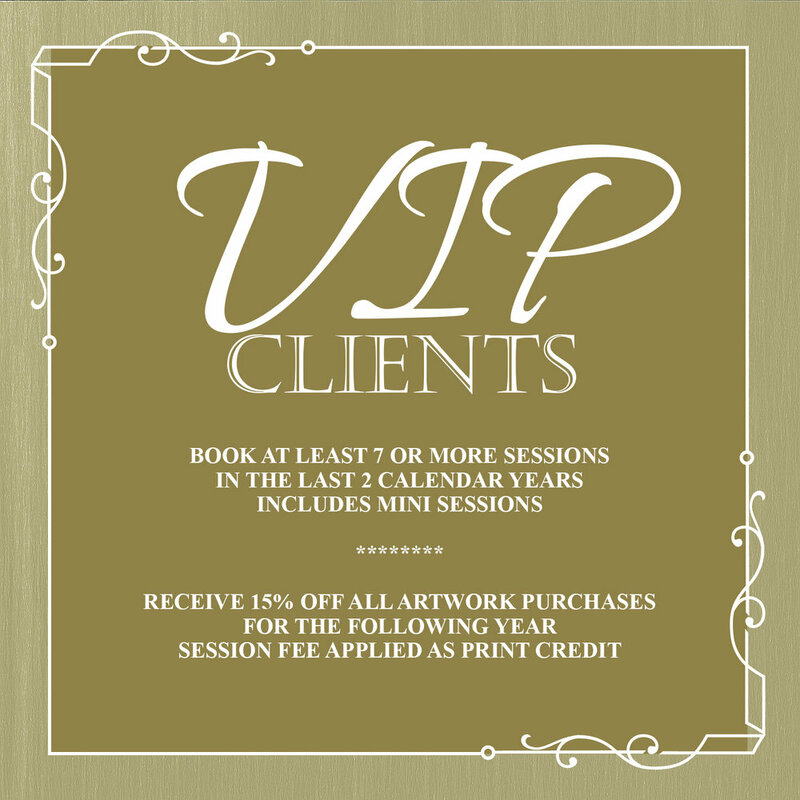 VIP Clients must have booked 7 or more sessions in the previous 2 calendar years. Themed mini sessions (Holiday, Summer, Seasonal, etc.) do quality for achieving VIP Client status! In addition to the 15% off, VIP Clients will also have their session fee applied towards their artwork purchase as a print credit. This special perk applies for regular sessions only. Once a client reached VIP status, they will maintain this status for the remainder of their relationship with Junebug Photography. Emails for qualifying clients will be sent out every January. Your 10% off counts towards any new sessions booked in the calendar year you received your email, and can be applied towards in person sales as well as online gallery sales. Elite Clients must have booked at least 5 full sessions in the previous 2 calendar years. Themed mini sessions (Holiday, Summer, Seasonal, etc.) do not quality for achieving Elite Client status. Emails for qualifying clients will be sent out every January. Your 15% off counts towards any new sessions booked in the calendar year you received your email, and can be applied towards in person sales as well as online gallery sales. Select Clients must have booked at least 3 full sessions in the previous 2 calendar years. Themed mini sessions (Holiday, Summer, Seasonal, etc.) do not quality for achieving Select Client status. Emails for qualifying clients will be sent out every January. Your 10% off counts towards any new sessions booked in the calendar year you received your email, and can be applied towards in person sales as well as online gallery sales. Ready to Become part of the Junebug Photography Family? ?